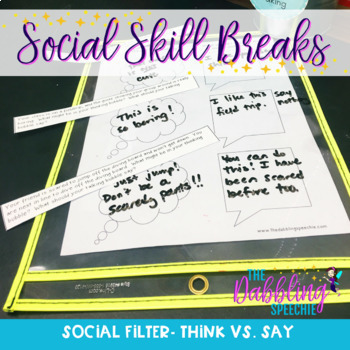 This social skills breaks curriculum resource covers a variety of skills including perspective taking, social behaviors, learning the social rules for situations, making impressions, keeping the conversation going, social filter (think vs. say), tone of voice and idioms. Once this social skills resource is prepped, SLPs, SPED teachers, counselors and teachers can grab a strip from a can to target a skill every day. Some of the social skill cans have worksheets that can be paired with the skill. It is a great set for speech therapists who have mixed group and need quick lessons for therapy. 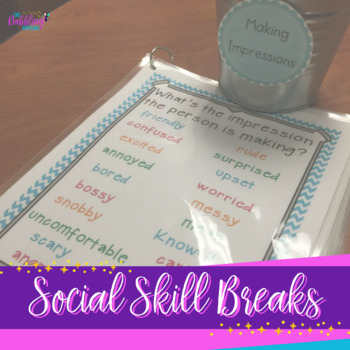 These activities can also be used in a classroom to target social skills daily to create opportunities for the speaking and listening standards. This is a winzip file. You need software to unzip the file. 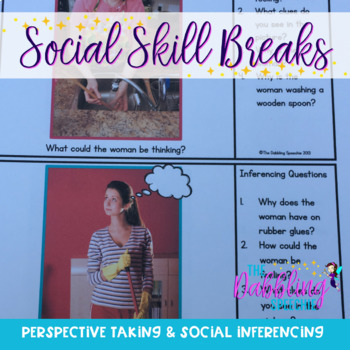 There is a PDF of the social skills resources and then an editable powerpoint file to customize your can labels and create your own strips for your students. -Carryover of social skills by targeting one scenario daily. Lessons are meant to take 5-10 minutes of time. -Quickly target social skills during groups containing students with a variety of goals (i.e., artic, grammar, and pragmatic language). Students working on other goals can participate as peer models. -Remaining time during the session can focus on the other needs/goals within the group. -For General Education and Special Education Teachers to use in their classrooms as daily mini lessons to work on social skills in between instruction time and to promote generalization of social skills across the school day. This pack helps me cover a social skill in 5-10 minutes allowing me 15-20 minutes to work on my other student’s goals. It allows me to use my typical students to act as a peer model while teaching. Help I Need Social Skills! 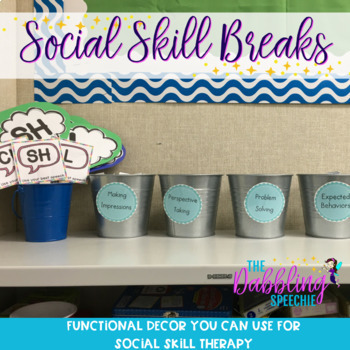 Check out my blog post about Social Skill Breaks for more information and pictures!